When a forest fire occurs, the damage it causes is widespread. This is the first part of a three part series examining the effects forest fires have on smoke and ozone, water, and the land. For more information, please contact Emily Rice at erice@b3strategies.com. Where there is fire, there is smoke. Wildfires, especially catastrophic wildfires such as the 2002 Rodeo-Chediski Fire and the 2011 Wallow Fire, cause severe smoke. Unsurprisingly, breathing smoke, a mixture of gases and fine particulates, can cause health problems, especially to individuals with pre-existing conditions such as asthma. Air quality conditions can cause recommendations for limiting outdoor exposure and restrictions to outdoor activities; for instance unhealthy air quality conditions in Washington State would keep all students indoors during recess. Image of the Rodeo-Chediski fire from the Tucson Citizen. It is likely not surprising that severe smoke can cause severe illness. Yet, beyond the health consequences of severe wildfires, smoke also causes severe damage to the ozone. With the Environmental Protection Agency’s (EPA) Clean Power Plan final rules released detailing the need for each state to reduce the carbon emissions, an important factor that is left out of the equation is carbon released from wildfires. The EPA considers carbon and particulate matter released by wildfires to be “background ozone,” or ozone that would exist without human interaction. According to a 1998 study, carbon emissions caused by forest fires made up 30-35% of their entire carbon emissions. Following the devastating wildfires in California in 2007, the National Center for Atmospheric Research estimated that the fires emitted “7.9 million metric tons of carbon dioxide from Oct. 19 through Oct. 26, the equivalent of about 25 percent of the average monthly emissions from all fossil fuel burning in the entire state of California.” A second study by the same organization, published in Carbon Balance and Management found that large-scale fires in the western states can cause as many carbon emissions in a few weeks as occurs in an entire year due to vehicle traffic. Catastrophic forest fires, outside of their damage to the land, watersheds, and the homes and structures that fire may threaten, cause damage to the health and environment as a whole, contributing to premature deaths, heart problems, and the severity of our environmental crisis. Without proper management, forests across the Western United States are at severe risk for continued catastrophic fires and the health risks that go along with them. 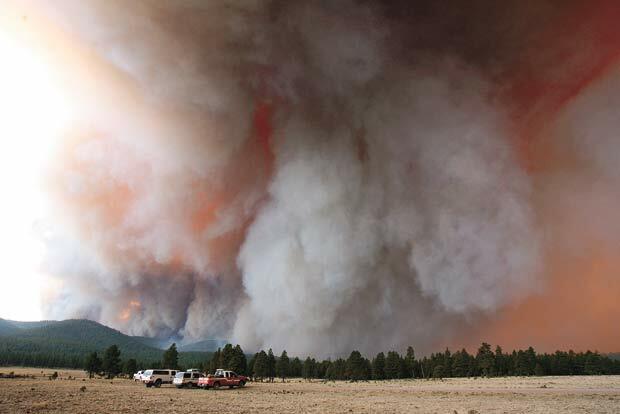 For more information on the risk of fire in Arizona’s forests, watch Russell Smoldon discuss how forest health management is cheaper than fighting forest fires, or reach out to the B3 Strategies team at erice@b3strategies.com.